Mountaintop removal moratorium — NOT! March 24, 2009 by Ken Ward Jr.
OK. OK. Calm down everybody. EPA Administrator Lisa Jackson (above, with President Obama) hasn’t denied any permits, and the agency certainly hasn’t issued a moratorium on new mountaintop removal permits — or on any kind of mining permits, for that matter.Â Industry-friendly changes the Bush administration made to the Clean Water Act fill rule and the Surface Mining Act buffer zone rule are still in effect. But, according to EPA, there’s bit quite a bit of confusion about what the agency has done.Â That’s been driven in part by the widely-disseminated story from The Associated Press — but fueled far more by wild speculation in the early press releases and commentaries from both sides. The Environmental Protection Agency is not halting, holding or placing a moratorium on any of the mining permit applications. Plain and simple. EPA has issued comments on two pending permit applications to the U.S. Army Corps of Engineers expressing serious concerns about the need to reduce the potential harmful impacts on water quality. EPA will take a close look at other permits that have been held back because of the 4th Circuit litigation.Â We fully anticipate that the bulk of these pending permit applications will not raise environmental concerns.Â In cases where a permit does raise environmental concerns, we will work expeditiously with the Army Corps of Engineers to determine how these concerns can be addressed. EPA’s submission of comments to the Corps on draft permits is a well-established procedure under the Clean Water Act to assure that environmental considerations are addressed in the permitting process. So far, it seems like West Virginia Gov. Joe Manchin is the only one not completely losing his cool. Well, he did quickly schedule a meeting with White House officials to discuss the situation. But it turns out Manchin was going to be in Washington anyway, and simply added a meeting with Council on Environmental Quality Chairwoman Nancy Sutley to an already packed schedule. The vision of Manchin riding in to save coal jobs loses some of its effect when you know he was already going to be in town. I look forward to meeting with [Sutley] and sharing our concerns and finding out the intent of this ruling. I believe the interpretation of the letters may be different than the intent, and I am confident that reasonable people can come together to find a solution where there might be differences. Kudos also to Rob Perks at the Natural Resources Defense Council‘s Switchboard blog, who is one of the only folks in the advocacy world to pick up on the second EPA statement. thanks, Ken. 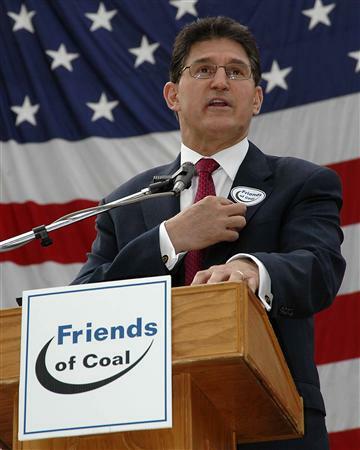 Not sure Manchin is much of a statesman on coal, but this gives some context. So basically it’s calm down everybody…business as usual…nothing to see here. Government MAY be attempting to do its job, however industry still has the upper hand. In case this reality is in danger, we’ve dispatched the head of state government to make sure nothing disturbs this status quo. Reasonable people would never question the way things currently work, right? After all, absentee companies stand to lose the right to operate free of actual consequences. If the West Virginians they employ lose the ability to permanently alter the state’s landscape for temporary monetary gain, surely something is wrong. Now how would they know this? And if mountain top removal does not raise any environmental concerns, what would raise them? The EPA seems to be saying they will not use the law to stop MTR, even though they have the responsibility to do so. Is this the “change” we were promised? It sure looks like business as usual to me. Thanks for the shout-out, Ken. I’m still scratching my head but here’s my latest thinking on what’s up with EPA re: MTR: http://switchboard.nrdc.org/blogs/rperks/making_sense_of_epas_mountaint.html. Love Coal Tattoo — it’s a must-read for me. Keep up the great work!